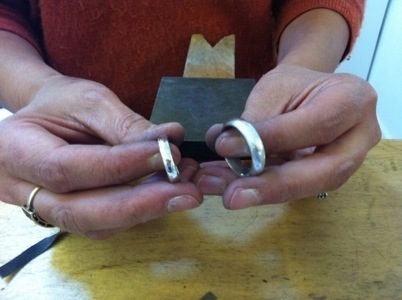 Over the past couple of years I have run the occasional workshop for couples to make their own wedding rings. This began when I was asked by a couple of friends, who then recommended me to their colleagues. I now offer this as part of my regular schedule as a one day workshop for couples to spend the day in the jewellery studio with me and make rings for each other, from start to finish. I will take you step by step through the process and by the end of the day your rings will be beautifully finished and you will be impressed and happy with your results. Even if you have never done any jewellery making before, you will be able to make perfectly finished rings, adding a little extra meaning to your wedding day knowing that you have created these for each other. 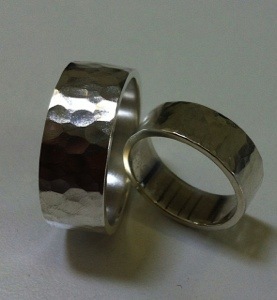 My experience shows that simple wedding bands, made and finished perfectly are the most satisfying. If you would prefer something a little more complicated, it is possible, but please contact me to discuss your ideas to ensure they are possible in one day. 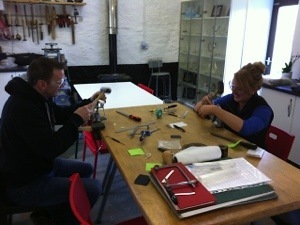 The standard workshop is £350 per couple and this includes sterling silver for two rings. If you would like to make your ring in gold then I am happy to discuss your requirements but the gold will be an additional cost. Please be aware that gold prices fluctuate on a daily basis and I would require payment in advance before ordering your materials. I would suggest that perhaps you make an appointment to visit the studio and discuss your requirements in greater detail if you want to make your wedding rings in gold. I include tea and coffee throughout the day but you will need to bring your own packed lunch. 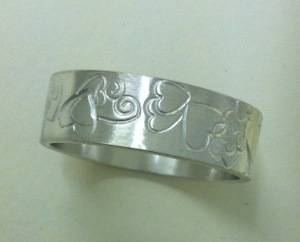 What could be more special and romantic than spending a day creating your own rings? My workshop is located in the beautiful landscape of the North York Moors near to Whitby, perfect for a romantic weekend away. This is a fun and relaxed day for anyone planning their unique handmade wedding – even complete beginners. The studio is not currently wheelchair accessible and students with disabilities should enquire about the suitability of the courses prior to booking. If you book a class and you know you have mobility or other issues which may impact on your ability to attend, then subsequently cancel, no refund will be given. It is your responsibility to ensure you fully understand our accessibility limitations before you book. 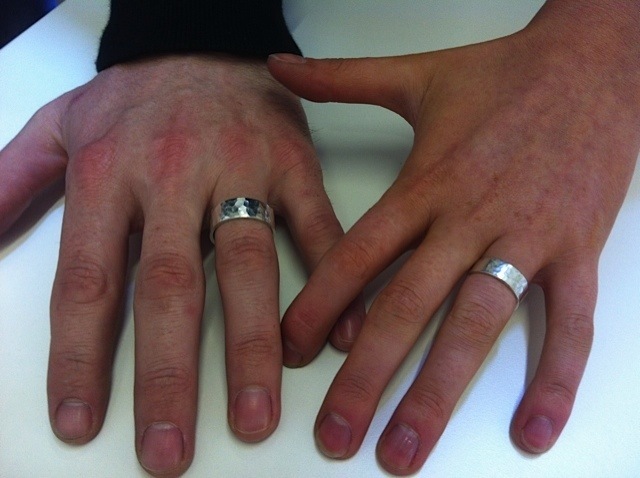 Wedding Rings – 50% deposit is required to secure the date to make your own wedding rings and is non-refundable. If you subsequently cancel the booking, no refund will be given. If you have made arrangements to make your ring in gold then payment for the metal for your rings will be required in advance. If, for any reason you cancel your booking No cash refund will be given for metal if it has already been purchased. If the metal has not been purchased a full refund will be given for the metal price quoted. If you are booked on a class, wedding ring day or course and you do not turn up on the day for any reason, no refund will be given. If you turn up and are considered to be incapable of working safely due to alcohol, drugs or general ill-health or fatigue, you will be excluded from the class with no refund. I reserve the right to exclude any student I feel may be a danger to themselves or other students. If due to unforeseen circumstances a course has to be cancelled by me, you will be offered an alternative date or a refund. You will be given as much notice as possible, however, I cannot be held responsible for your travel or accommodation costs.